Reproducible on Ubuntu Trusty Desktop 20140413 AMD64, Ubuntu Gnome, Kubuntu. 1. Prepare a GPT or MSDOS disk with 1 primary partition of type FAT32 which uses all disk space. and a unreadable error dialog. I've got the daily kubuntu amd64 desktop image on a usb stick, booted via grub2. 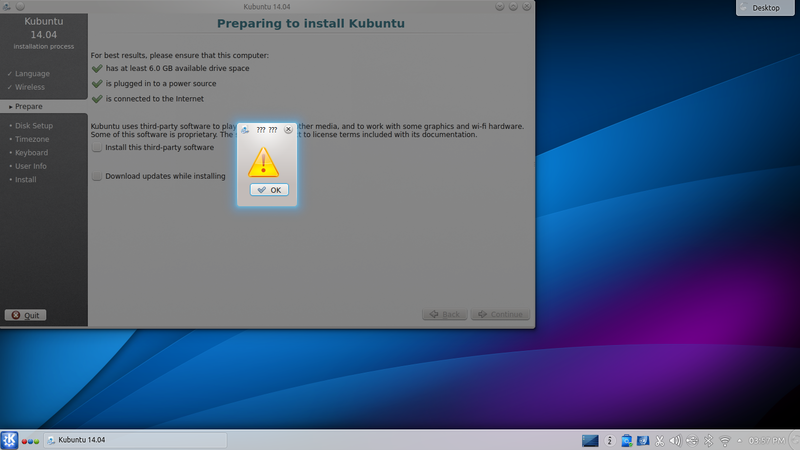 When I get to the part where the installer wants to unmount partitions, I get an unreadable error message, and the installer sits on "Preparing to install Kubuntu" with the Back and Continue buttons greyed out. Apr 11 15:57:03 kubuntu ntfsresize: You might resize at 61936762880 bytes or 61937 MB (freeing 78118 MB). Apr 11 15:57:03 kubuntu ntfsresize: Please make a test run using both the -n and -s options before real resizing! Here is the crash file. I've recreated this on today's ubuntu image as well. I didn't notice it on ubuntu images earlier this week using the same procedure, so it may be something new. Can you run sudo parted -l? Confirmed by another report on Ubuntu Gnome 20140412. FWIW, the problem also occurs on BIOS boots and with MBR partition tables, not just EFI boot with GPT. Much simpler test case: "print NUMBER" in parted, where NUMBER is the partition number of a FAT-formatted partition on a local disk. * Fix crash when opening FAT file systems (LP: #1306704).